In 1874 at the Montgomery Baptist Church, withdrawing the “hand of fellowship” meant. C. Changing assigned seats to the back of the church. I love this time of year. Changing foliage, baseball playoffs, apple cider... and yes snow on the way soon...but I shouldn't get ahead of myself. My wife and I have a large clump of blueberry bushes on our property and have enjoyed picking through the months of August and September for the last 10 years. An average year yields about 15 gallons, we've picked as many as 25. This year we've harvested about 22 and the freezer is full. Sometimes it seems like they grow as fast as we can pick them. My Yankee heritage makes me want to get every last one... ah the satisfaction of a good crop. Likewise I was reminded of our organization's good fortune recently as I made a presentation on the MHS to one of the Vermont Historical Society's "Connecting To Collections" workshops. The group was astounded by our membership and budget numbers and wanted to know our secret. No secrets I said, just hard work by the Board, a generous membership, and a supportive community. In that vein I'm thrilled to announce we exceeded our 2008 goals of 200 memberships and $10,000 in membership revenue for the second year in a row. A wonderful crop from which we can all take a good measure of satisfaction. Thank you all and a special thanks to membership guru, Marijke Dollois. Mark the date... Our annual community sing along is scheduled for Sunday, December 21st at 5:00 p.m. We hope to have Maestro Andrew Massey once again lead us in a fun evening of caroling. Pratt Hall will be decorated and we will include storytelling, dancing, and even a few seasonal and family appropriate jokes. Some final thoughts on the exhibit... The packing case arrived in September and is now on display at Pratt Hall. Thanks to Gary Wetherbee for picking it up in Ohio and to Matt, Mary and John Leonbruno for helping us secure it once we won the Ebay auction. We also have added some tokens, used as pay, and redeemable in the Company Store which was located where the present day Snowshoe Pub is located. Thanks to Lauri DeCiucies for donating them. We also have a one page memoir based on a discussion with Gaston Begnoche who worked in a sister mill in Richford. He also owns the farm where the Montgomery mill was located. We will be sharing all of this with the school and show it to others by appointment through the end of November. Please call a Board member if you would like to arrange a showing. This year's reception and show was well attended and the feedback very positive on the new lighting and display boards. Noela McGroarty did a magnificent job spearheading this year's event, and wants to thank all the participating artists. 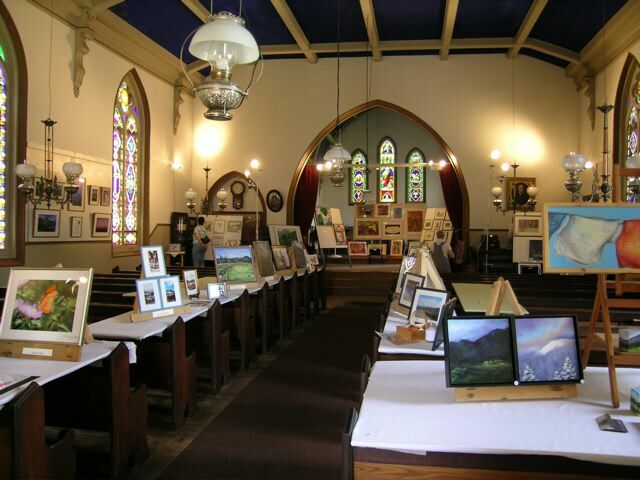 Special thanks to Bill McGroarty, and Marijke Dollois for assembling and painting the new displays, and to Parma Jewett for super refreshments and the foil painting donated for the the raffle. Member - $275/event comprised of the following: $175 + $100 refundable reservation and cleaning/damage deposit. Member - $325/event comprised of the following: $225 + $100 refundable reservation and cleaning/damage deposit. Non-member - $375/event comprised of the following: $275 + $100 refundable reservation and cleaning/damage deposit. The policy is posted on line at www.montgomeryvt.us/mhs.htm or can be obtained by contacting any Board Member. We continue to benefit from donations of artifacts, funds, and services. In addition to the donations already mentioned, thanks to Fern Perley who donated a signed photograph of Gov. Madeline Kunin and Merrill Perley at the signing of Housebill #8665 which settled the boundary line dispute of Avery’s Gore between Enosburg and Montgomery – most of Avery’s Gore went to Montgomery. Additionally, Betty Stanton made a $1,000 donation to the general fund to help us make progress on a new exhibit and storage space. About 25 people enjoyed the presentation by Azoniz (aka Jeanne Brink) on Western Abenaki culture and tradition. 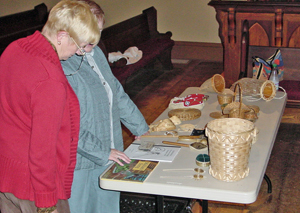 She displayed and explained baskets, rattles, and clothing; and taught us some Abenaki vocabulary. Thanks to Sally Newton and Charles Henderson for bringing her to us and the Vermont Humanities Council for sponsoring her visit and presentation. The August 9th program with Betty and members of her family was a grand success. She shared stories of her, and her ancestors experiences in Montgomery accompanied with photos, original letters (with transcriptions), quilts, fabrics, china, and other ephemera, most of which she donated to the MHS!! Thanks to Betty for a fun evening, and her enthusiastic support of Montgomery and the MHS. The pest treatment work for Pratt Hall will be done next June. This will include the basement, tower, and the attic spaces. In the meantime Bill McGroarty, John Beaty, and Pat Farmer have begun the tedious and sometimes nasty work of cleaning the cobwebs, dust and other debris out of the tower, a prerequisite to spraying for powder post beetles. We may ask you to give us a hand if you can and we will work to get a grant to help finance that project. The Board took the next step in the process of evaluating Pratt Hall for structural repairs. Following the evaluation by VT Historic Preservation and architect Michael Gohl, we were urged to have expert timber framer and historian Jan Lewandoski take a look. He was able to confirm much of the earlier assessment, identified other issues, and gave us costed estimates of the recommended repairs. 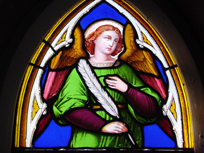 His report will be used for further grant writing. Thanks to the technical assistance from member Ave Leslie, we now have Elders' Nights I and II, and the recent Betty Stanton program on DVD and included in our archive for posterity. B. Excommunication. Parishioners could be removed on recommendation of the Committee of Investigation for any number of offenses, including licentiousness, profanity, continual neglect of religious culture, drunkenness, and/or general looseness of daily living that dishonors the name of Christ. The Montgomery Historical Society Board is... Scott Perry, Bill Branthoover, Marijke Dollois, Sue Wilson, Bill McGroarty, Parma Jewett, Sally Newton, John Beaty, Jo Anne Bennett, and Pat Farmer. Meetings are the third Wednesday of the month and are open to all MHS members. If you haven't recently, may we suggest you check out our web site. We continue to add content, like the 1985 National Register of Historic Places Nomination for Pratt Hall, and are eager to hear your feedback.